CLC foam concrete machine for housing construction project has powerful functions, such as pressure, roof insulation, cast-in-situ and floor heating, given that they have a good performance in environmental projects, so also called, lightweight foam concrete making machine or cells of lightweight foam concrete machines. The GM2000 foam concrete mixer and GP30 foam concrete pump is a good match, simple operation and convenient mobile site. Besides, the foam blending, fast, blowing foam uniformly. Without suspended matter, without the declining, it’s good for steady pouring. Little loss ratio of foam maintain the foam proportion in the foam concrete to make the products with stability density. 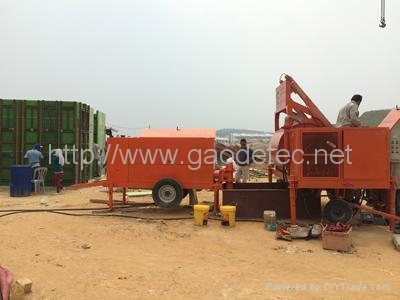 So if you have interesting about house building, the GM2000 foam concrete machine is a good choice for you!